It's harvest time. Combines and tractors hauling grain to be loaded into trucks to be taken to the grain facility are everywhere this time of year. The smell of the harvest lingers in the air. If you have never smelled a corn field as it's being harvested, I can't really describe it. It's earth and plants and grain and summer's heat all rolled into one. I remember the bright orange of the corn as it was augured into the grainery in the fall in preparation for feeding the cows and pigs in the winter. We used to stand in the grainery and feel the pressure of the oats and corn as it tumbled around us. Mom would yell, "Don't come inside complaining to me you itch!" Corn and oat dust is really itchy and it quickly gets under your clothes and in the crevasses of the elbows and neck and knees. We would have to strip in the porch and scamper into the bath to wash it off. We were allowed to stand in the tumbling grain until it got up to our knees and then we had to get out. Corn and oat dust will suffocate you if you're in the confined space too long. Dad or grandpa or an uncle would climb in and smooth out the grain pile so more could be added. By spring, we'd be down to a corner's worth of grain and the stuff on the bottom was fermented and moldy. You never ever fed that to the animals. It would make them violently ill. I also remember dad paying us 10 cents an ear to walk the corn rows and pick up the ears of corn that the combine missed. Those ears would be used for fodder and the occasional squirrel. When I would pass the combines doing their work, I would slow down to get a nice whiff of the scent of fall in Iowa. I miss it. The fields around Dale's farm had been harvested. What was left to do was disc the leftover stalks into the ground as a natural mulch and fertilizer. On Sunday, the field near the house was being done by the guy who rents it. He was out there, working away at it, until at least 11 p.m. When I was growing up, tractors had front light but not the lights they have now, almost akin to UFO's. You plowed until you really couldn't see and many was the farmer discing by the light of the full moon in October and November. Most of you will never have the chance to follow this on a country road. 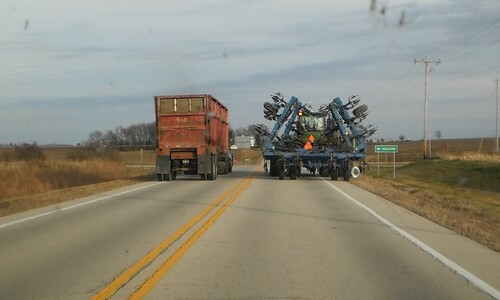 It's easy to get 10 cars stacked up behind him as he moves his equipment from field to field. You don't go "fast" when you're pulling something like this or driving your combine from the field to the house for the evening. I couldn't be a farmer's wife. I've become too urban, but I am very grateful my upbringing included exposure to this way of life. I understand some of the trials and tribulations of the harvest. When you're in a hurry, it's easy to forget that these guys feed the cows that give you your hamburger or that provide the grains to make your veggie burger. Here's to another fall passing. I could smell the change of seasons in the air. I don't think it changes in the city quite like it changes in the country.